With Forge World releasing their Legion MKIV Command Squad upgrades, I thought I might take a look at how you can make something similar and much cheaper. I like the idea of Command squads even if they aren't the most effective choice. The idea of representing the unit that is commanding your force appeals to me for the modeling and painting opportunities most of all. The chance to convert something slightly different so it stands out on the table is one I rarely pass up. That being said, the Forge World conversion bits are suited for a very specific time period and MK armour. I've been a bit more free in my interpretation and tried for something that was close, but maybe not exact. This might be more for the budget conscious hobbyist who wants to represent their Heresy era command squad without dropping a ton of cash for a couple models. These are nothing new. I used to make my own until I found them already made by Secret Weapon minis. Buying them is the way to go hands down. It's not worth trying to sculpt this little piece when you can pick up a pack of them. It can be done, but it's one of those things you're better off buying and saving yourself the modeling headache. All I did for my Champion model is simply glue one of the roman style helmet crests in place. Add a leather strap tabard which is super easy to do (you can make this part) and you've got a completely different model in a few seconds. This piece is a bit more difficult, but not impossible to recreate. You don't have to be spot on, just close. 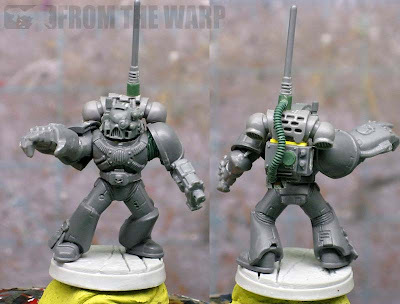 This is because Space Marine backpacks are so iconic, all you have to do is alter it slightly and folks will recognize it as being a "different" model used for something else. I started by finding a suitable head to go along with it. If you had the MKIV helmet and wanted to convert it with the addition of some optics and such, you could. I cheated a bit and went with something already done and available. You could use any style really, all you need is a helmet with all the fancy optics and such on it. You just need something to represent the modification, it doesn't have to be exact. And now onto the backpack itself. I used the top half of a regular Space Marine backpack and the bottom half of an Imperial Guard vox caster turned upside down. You could probably use just about anything that was box shaped and the right size. Add a few rivets, some plugs and a cable and you'd be all set. I added the antenna from the Imperial Guard vox to the top of my backpack and sculpted a cable to run down the back as well for good measure. Besides, the cable helps hide the hack conversion work which is a nice feature. All in all, I'm calling these a win for the time involved and the look I get in the end. They're not exact, but they are close enough that I'm comfortable with them and I know that a little bit of paint will help sell the illusion as well. It took no time at all to do these (the helmet crest is no real work at all) and the backpack took ten minutes tops if I count all the time I spent looking through my bits box at stuff I'd forgotten I had. 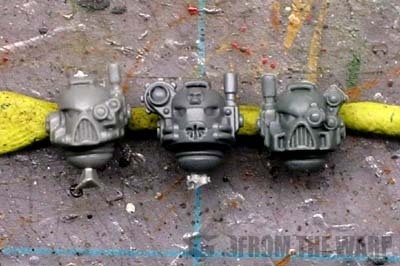 Spend a few more minutes on them and you could have a conversion that is even closer to the Forge World bits just put out. I don't like the new command squad of forgeworld that much, but i do like convertions like this! Nice stuff; I completely agree about having a command squad as the elite Troops unit, the "First Captain's squad" sort of deal. Currently working on a new Plague Champion in Mk.III Iron Armour to lead a similarly-armoured squad, now that the new CSM Codex's dust is clearing a bit and my lists are starting to come together. Old Shatter Hands did a great Long Fangs Pack Leader, with a cool pose, Geordie La Forge visor and IG comms pack. Maxmini do a version, called "Tribe of Black Lotus". You used to be able to pick which heads you wanted. Just cut the crest from the head and add it to the Marine just like you have. See if you think they are more like the FW version in terms of size. D.W.G. Wals: Thanks, I like them for the modeling opportunities. I think the whole Heresy-era thing has opened up so much more for folks these days. Mordian7th: Keep everything... truer words were never spoken. I keep all of the little bits I have even if they won't work for anything else other that battlefield debris. svartmetall: Sounds cool. Even if you don't use them as what they are (maybe the rules don't support them), you can still model them for the look. Marshal Wilhelm: Thanks for the links, those are some nice conversions. The crest I used is a bit smaller. It comes down to finding the look you like and keeping it cost effective at the same time. 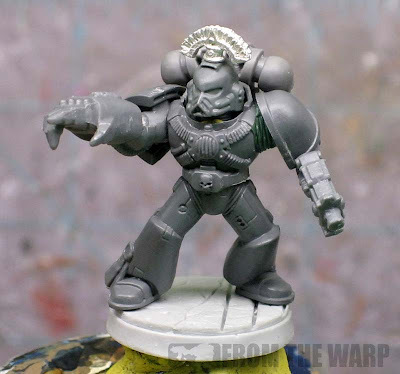 Loving the heresy era articles, as I'm building a Sons of Horus force atm and trying not to shell out several hundred quid on Forge World items. I'm saving each of them into a folder for future reference, so keep them coming! 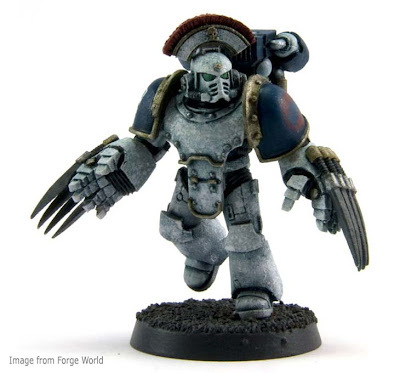 This article has given me ideas for completing my tactical squad, great article as always Ron! @Bog Witch: That head is from the ravenwing upgrade sprue (If I remember correctly). 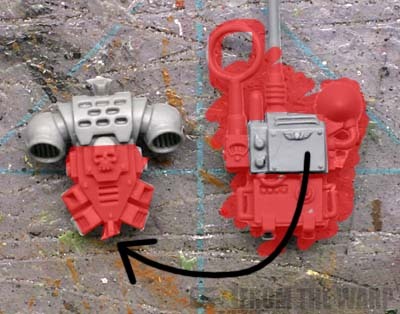 Khorneguy: Pre-Heresy jump packs huh... I've seen them done before on the cheap. I'll have to see how easy that is to duplicate. Bog Witch: I think it's from the older Dark Angel set/sprue thingy. I'm not sure exactly, but it obviously has all kinds of extras on it. The only thing you'd need to do is fill in the front DA symbol with some greenstuff. It makes for a great Techmarine helmet too. And yes, the Tentacle Maker from GSI is a wonderful tool to have.